Taking a dip, and almost getting cooked! Fun times this evening. Having never really had to DO a formalin dip (counting my blessings many times over) I did NOT just willy nilly start off with the Maroons. Heck no. Instead, I started off with the Polymnus and Allardi. “Practice” on the “replaceable” fish. Now, they’ve been in a tank already being treated with Formalin at a rate of 1 drop per gallon. Again, this is at hyposaline conditions of 1.010. For the dip, I went all around and found so much honestly confusing information, partially stemming from the fact that some forms of “Formalin” are the real deal (a 37% solution of Formaldehyde) and products on the shelf are DILUTED Formalin, but they really need to rework how they worded that and include a better description of the active ingredients in their products. Why? Well, because of course, being fried from OT, and thinking I’d really done all my homework, I went with the wrong concentrations in my dip. Have probably killed my “replaceable” fish, having dipped them at far too high a concentration. However, I was on hand the entire time and immediately removed them when I realized things were not going right. An hour later, they are all still alive but clearly stressed, more so than when they went in. “Smart Thinking” to practice, dumb thinking for reading the same manufacturer’s dosing information repurposed on a few websites and thinking “aha…OK, that’s straight from the manufacturer of this Formalin product, they call it Formalin…refer to it that way…I should be good”. It was definitely MY FAULT, as of course, the formalin I own doesn’t have dosing instuctions for dipping, only for tank usage! Figures. OK. I’m going to pretend I didn’t just do all that and go on again. Oh, and that reminds me, when I did my hypo, I did check with my refractometer, but I ALSO checked the refractometer itself. I don’t have calibration solution on hand (although I’ve made it in the past) but an easy test, checked it on RODI water, and then on my SPS reef (I don’t mix salt and test it anymore, I have a good volume based system that never fails me, hasn’t in all these years…). Got 1.000 on the RODI, and 1.025 on the SPS tank. Refractometer checks out OK by me! Ok, back to the dips. I’m about to go do them, and here’s what I’ve ascertained is the PROPER dip with REAL, true straight up standard FORMALIN. 1 ML Formalin per 1 gallon of water. I’ll be pulling out 1 gallon of the hypo-saline water from the tank, adding heavy aeration and 1 ML (or 20 drops) of Formalin to the water. The fish will remain in this dip for up to 45 minutes tonight. I’m splitting the difference, as some recommendations are 30-45, others 45-60. Frequency of dipping also varies greatly. 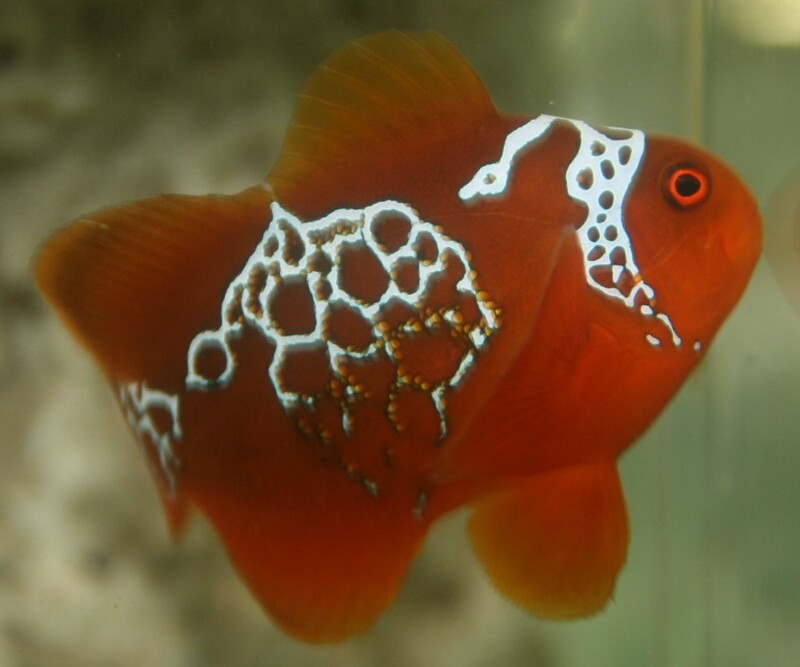 I have to pick SOMEONE’s advice, so I’m going with Matthew L. Wittenrich on this one – see page 161 of his “Complete Illustrated Breeder’s Guide to Marine Aquarium Fishes”. 3 dips, every other day (so tonight, Sunday night and Tuesday night), and we’ll see where we are at that point. MANY others suggest that in addition to dipping, you need to keep a constant formalin bath going. The logic is sound, given that you need to kill off the Brooklynella that’ s in the tank as well. I’m fighting a tough battle on this one internally, and not every person recommends it, and it does some nasty things to the tank (i.e. it’ll definitely kill off the macro-life on the live rock). In theory, the hyposalinity should already be controlling Brooklynella in the tank. I haven’t made this decision yet. I’m off to dip the FEMALE first with the new instructions I’ve outlined above. Last fish to get a dip will be the Lightning Maroon. Wish me luck, and send good vibes. The fish certainly could use it. I prepped some water this morning to do the next change to bring things down as I outlined earlier today. I tried a little feeding, neither fish was interested. Did a water test just to be safe. 1.014, pH 8.2, Ammonia, Nitrite at 0, Nitrate at 0-ish. As I was draining down the Maroon’s tank, I saw that the larger Female has the first telltale signs of Brooklynella on her upper right flank. So between “mellow” behavior and no appetites, I’m convinced the fish already have Brooklynella, it’s just not bad yet. I could break out the microscope to see, but it’s not that great at this type of stuff. We’re at 1.010 as of this time. Emailed my most trusted advisers and I’ll ask you all the same question I asked them. Thoughts? (update – only an hour later, the Lightning Maroon is back to his inquisitive self following the last salinity drop and turning off the main tank lights. Maybe I’ll try feeding again this evening). Not Hypochondriac, Hyposaline! I’ve heard stories of people who get an “uber rare fish” and end up killing it because they worry too much about it or just fuss over it. I promise I am not going to be that guy. 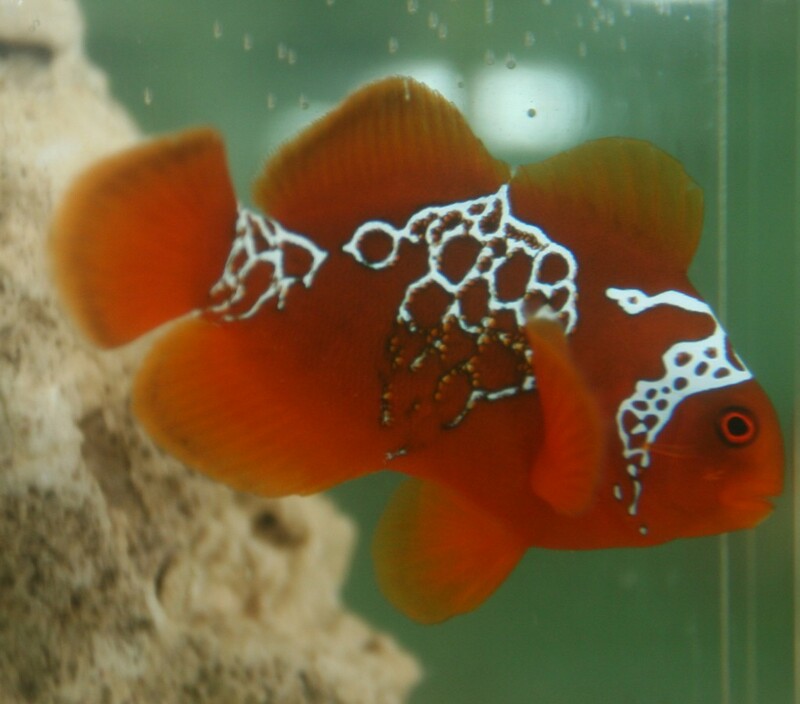 The Maroons are still settling in, but I’m taking prevenative steps that everyone working with clownfish should consider. Let me stress now that I USE QT (quarantine) but even I admit, I don’t do it often enough. It just so happens that in the case of the Lighting Clown, the “QT” and the “final destination” tank are one and the same. I’ll be circling back around to recap the entire story of the Lightning Maroon and it’s mate to date in the coming days and weeks, but I felt this was worth an immediate update. In asking for any and all advice on how to treat these fish now that they are in my care, Joe Lichtenbert was adamant about putting the fish into Hyposalinity at 1.010 as a prophylactic measure to prevent Brooklynella. This “treatment” should last at least 2 weeks. Edgar Diaz 100% concurred. I honestly think Mark has been so busy he’s still catching up on my emails from 2 days ago! With any wild caught clownfish, even with the BEST CARE the entire way, Brooklynella is a legitimate concern and something anyone working with clownfish MUST anticipate. Along with the Lightning Maroon, Mark had sent other clowns that I had on order, which had been on hold for me while I was out speaking @ MASM’s MBI and LIRA’s NERAC V.
In the end, thinking this through carefully, they were right to make this recommendation. Joe told me Maroons are known to be PRONE to Brooklynella, which I hadn’t recalled but sure enough, it’s mentioned in the literature. Those clowns I mentioned…well, the happy, healthy, eating like a pig Allardis (Amphiprion allardi)…one of them showed the signs of Brooklynella last night, as did a stunning PNG Saddleback (Amphiprion polymnus). They’re in a separate system from the Lightning Maroons. Doesn’t matter. That sealed the deal for me. If it can happen to fish that are FULLY “settled in” and “looking great”, I considered that my warning from above. And so, ALL the new clowns that arrived this week, including the Lightning Maroons, are being brought to hyposaline conditions at 1.010. As of this morning, the Lightning Maroons are at 1.014, and the other system was at 1.015. The clowns that showed brook, their system had all the non-vertebrates (snails, hermits and Caulerpa) removed, and Formalin was dosed at the suggested rate of the manufacturer at 1 drop per gallon. As time permits, I’ll get both systems down to 1.010 by the end of the day, and they’ll stay there until sometime in the middle of April. So, what do you think? Am I nuts? Wise? Please post your comments, thoughs and experiences with hyposalinity below! Life Altering Chaos…light getting stuck by lightning! I’ve been scrambling, working overtime, and bottom line, the timing of this opportunity couldn’t have been worse. But you can’t really pick when Steven Paul is going to find and collect a unique Papua New Guinea Maroon Clownfish (Premnas biaculeatus), let alone when it’s going to be offered to you. It’s going to take a couple weeks to get the project website up and running, heck, being an interactive software developer I figured this project was a great excuse to learn to use WordPress. Forgive me for anything you don’t like about the website, but do speak up. Be a harsh critic, it will make me a better developer. 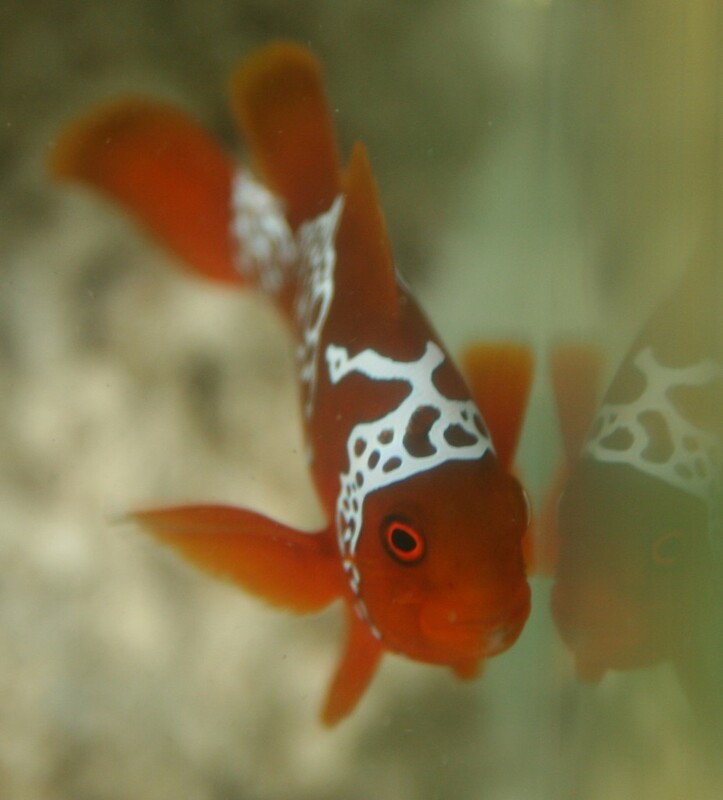 Anyone who knows anything about Clownfish breeding knows that we’re on their timetable, and that timetable is often measured in years. And yet, the entire notion of The Lightning Project was conceived and blessed in 48 hours over email, internet and Fed Ex, all in the name of just sharing my ideas on what I would do IF I were to be the one to own such a fish, never thinking I would. Lightning has struck in the Pedersen aquariums. 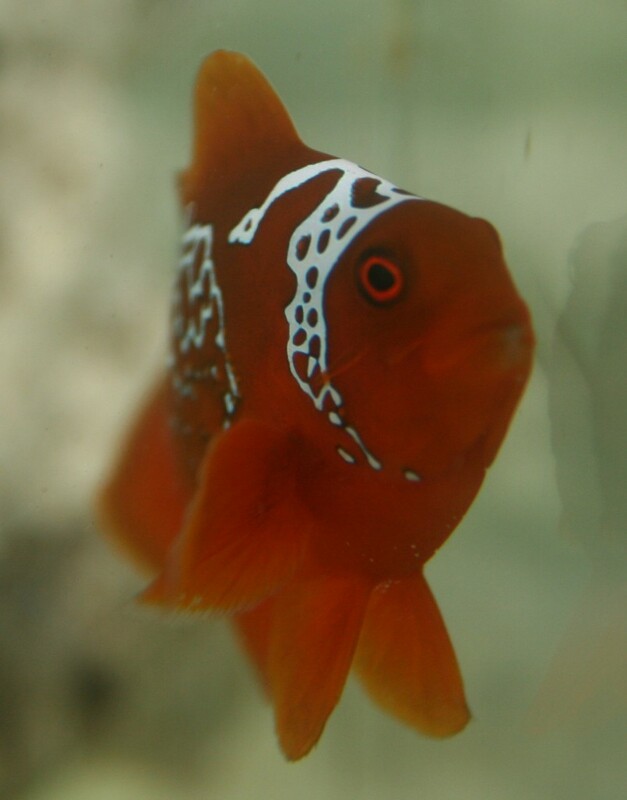 Perhaps the most exciting aspect of the Lightning Maroon Clownfish is that the anticipated waiting game gives project contributors and advisors the opportunity and excuse to discuss a myriad of issues ranging from sustainable collection and fair trade to clownfish genetics and the general direction of captive breeding efforts. No doubt, some will take my decision to be a steward of the Lightning Maroon as a very hypocritical endeavor given my anti-hybrid, anti-guppification stance pertaining to marine fish breeding. Nothing stirs dialog like a good bit of controversey, right? Ultimately, it will all be put thrown to the wall, and we’ll see what sticks. Perhaps the greatest thing that the Lighting Maroon might do is not produce more Lightning Maroons, but act as a magnet and bullhorn for dialog about a more responsible, sustainable, and ethical Marine Aquarium Industry. Perhaps we may find a better path than whatever one we’re currently on. It is my hope to give periodic updates on our little Ambassador from PNG and SEASMART as he (or she?) settles into a new life in captivity. I will spare no detail, explain my thinking, answer questions, solicit 2nd and 42nd opinions, and document it all. In this manner, whether the actual goal is achieved, many ancillary benefits will come from this exercise. Working with something so exceedingly new and rare has been a very thrilling and terrifying prospect, and arguably this is far more responsibility than one lone hobbyist probably should be handed. While I’ve tackled arguably far more difficult projects, I’ve recognized the simple truth that if things do not go well, my legacy in the aquarium hobby could go from being “the guy who was first to captive breed Harlequin Filefish” to “the guy who killed the Lightning Maroon”. But, advice that put my mind at ease came from none other than cowboy fishkeeper and outspoken aquarist Jake Adams, who said “Don’t regret the things you try, only regret the things you don’t try.” Spoken like a true instigator Mr. Adams! Ultimately it is an honor to have been considered and ultimately accepted as the individual to take charge of this fascinating fish. It is my opinion that on technical and experiential merits, there were many people far more qualified. It is my understanding that technical merit was not the ONLY consideration at play when decisions were made. For what it’s worth, I will be inviting my most trusted breeding colleagues to contribute and function as advisers to the project. I hope that any jealousies or resentments would be quickly dispelled when the full premise of the project is laid out before them. Many times now, I’ve considered the reality that hobbyist failures are just as important, if not more so, than successes. Knowing I have MANY failures in my past breeding efforts, far outweighing my successes, I’ve ultimately decided that 100% transparency in this project, even at the risk of public failure, will still be worth it. History may decide whether the decisions that brought this fish to me were wise, but regardless, we ALL can learn something from this project. Finally, I owe thanks to many people and businesses for this opportunity. Ret Talbot & Mark Martin, thank YOU for never tiring of the constant communication as we worked this out. Thanks to the people who put Ret in PNG in the first place! Steven Paul, thank you for collecting the fish! Pacific Aqua Farms, SEASMART, and Blue Zoo Aquatics, even Fed Ex, thanks for handling this fish with exceptional care in bringing this fish from the ocean to my home! Thanks to Jake Adams for your personal cheerleading, and Joe Lichtenbert, for being one of the first Breeding Advisors I knew I could bring into the fold immediately for advice and a second opinion on everything I might do! Thanks to those people (including Clint Manchester ) who snapped up the fish I offered for sale at a moment’s notice, so I had the funds and tankspace to commit to this adventure. There will be many, many people to tank in the future, and there are probably already many people I owe gratitude to that I may never ever know. The best I can offer is my pledge to be above board, and to do my very best to not let you down! Thank you to all who believe in me and my abilities, I am truly humbled and do not believe for a moment that I was the ONLY “best choice” for this project. I will be inviting many other people to advise me. Ultimately, this IS my project now, my work, and I’ll be calling the shots. But I realize that this isn’t about “me”. This isn’t just my fish, it’s the hobby’s fish, the industry’s fish, Blue Zoo Aquatic’s Fish, Pacific Aqua Farm’s fish, SEASMART’s Fish, Steven Paul’s fish, Papua New Guinea’s fish and before that, good ‘ole Mother Nature’s fish. I will have a lot of people to answer to if I don’t consistently give this project my best. Therefore, this is not “my” project, this is OUR project. The power of positive thinking has truly fueled some of the accomplishments I’m most proud of, please send all well wishes, good vibes, and extra karma to the SEASMART PNG Ambassador now swimming in my basement. A NOTE ABOUT COPYRIGHT – being a multimedia developer, I’m especially careful about copyright. You should be too. All pictures I post that aren’t by me are cited AND I’ve received permission from the photographer to utilize them. Please RESPECT the copyright ownership of contributors and do not repost their work without their explicit permission and credit. I asked Ret if he had any photos I could post since I have yet to get a replacement camera transfer cord (lost it somewhere between LIRA’s NERAC V in Riverhead New York and my ultimate destination back in Duluth, MN!). Ret supplied 4 shots taken on location in PNG that I had not seen until tonight. Enjoy!